Home» Green Tips » Gas Prices Ruining Your Summer Vacation? Are prices at the pump forcing you to forgo a vacation? High transportation costs force many Americans to consider the “staycation” this summer. If your family is one of those, congratulations! Instead of sitting around the house, start planning your summer adventure. Spend a few days camping at the Friends Creek Campground near Argenta, Illinois, visit the Governor Oglesby Mansion, plan some hike and picnic events at a conservation area near you. 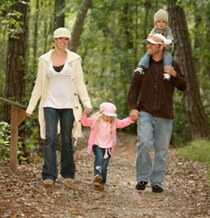 Enjoy a family bike ride on one of the many bike trails in Macon County. You are sure to give your kids something to write about in their back-to-school, “what I did on my summer vacation” essay.